BLEC GLOBAL will use BTME to launch new products for the grounds care and sportsturf marketplace. As well as the new products, under wraps until the show, the BLEC team will be showing the proven GKB Sandfiller. 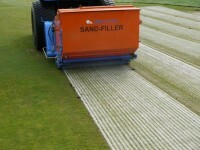 The Sandfiller has been specifically designed for aerating and draining sports turf. This tractor-mounted scarifier and sandslitter removes and collects spoil and fills grooves with sand in one pass. Says BLEC managing director Gary Mumby: "Harrogate is a very important show for us where we get the chance to start the year by showing all our innovations for sportsturf and landscaping professionals. "It is a great place to catch up with customers and old friends and we look forward to seeing them on the stand."